On a day that began with a major ruling against Republican voting laws in North Carolina, a federal judge in Wisconsin issued a sweeping ruling that declared a number of Republican-authored election laws in that state unconstitutional. There was also a ruling against Republican voting laws in Kansas, where a county judge ruled that the state must count potentially thousands of votes in state and local races from people who have registered without providing citizenship documents. Two Wisconsin liberal groups filed a lawsuit in May challenging laws including a requirement that voters show photo identification. 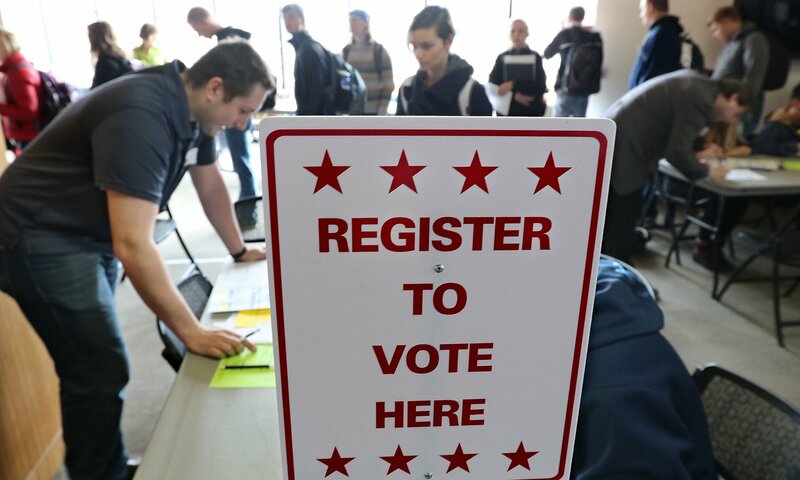 US district judge James Peterson issued a ruling on Friday that upheld the voter ID law but struck down a number of Republican-written statutes and policies that restricted voting. Peterson ordered the state to quickly issue credentials valid for voting to anyone trying to obtain a free photo ID for voting. He also struck down a restriction limiting municipalities to one location for in-person absentee voting, time limits on in-person absentee voting, an increase in residency requirements from 10 to 28 days, and a prohibition on using expired but otherwise qualifying student IDs to vote. In Kansas, the order from Shawnee County district judge Larry Hendricks came only four days before Tuesday’s primary election. Hendricks blocked an administrative rule from state secretary of state Kris Kobach.